While other publishers have been wary of making good use of Steam’s Early Access provision, Paradox have leapt straight in, landing with a triumphant forward roll into open development. 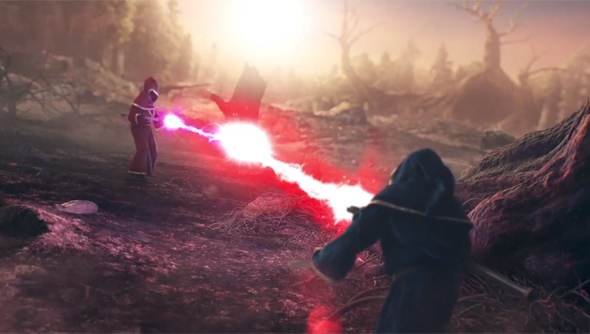 They launched Fatshark’s War of the Vikings in alpha scarcely two weeks ago, and today trumpeted the arrival of Magicka: Wizard Wars, the PvP arena spell-smusher from their own Paradox North studio. Alpha access comes in three tiered packages, each of which include unique rewards for early adopters. The $12.99 Starter Wizard Pack is all aesthetic upgrades to both your in-game and forum avatar – but the $19.99 Founder Pack also finds space for developer forum access and a copy of the excellent Crusader Kings II. Finally, there’s a $49.99 option – the IMPressive Founder’s Pack – which includes all of the above and tops it with the ability to name an in-game imp, plus an extra three alpha codes to assign to your most capable mage friends. I must stress, however, that Wizard Wars will be entirely free to play upon its full release early next year. If a head start is of no value to you, then you’re probably better waiting. Our Julian found Magicka: Wizard Wars to be “one of the most batshit versus games I’ve ever played”. This from a man who prowls the sewers of Leeds at night in search of mano-a-mano combat. Do you think it’ll be to your tastes?